Within this category you can view information and photos about different places I’ve visited with the family. 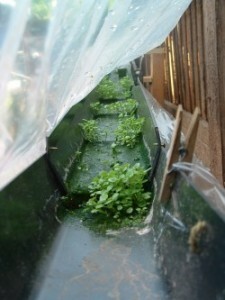 Some of which are related to Hydroponic growing, others are just nice places we’ve visited. The photos are taken from both the UK and around the world if we’re lucky enough to get to travel. 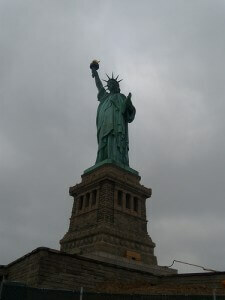 I was up at 7.00am this morning, ready for our trip to the Statue of Liberty. Our ferry ticket was 11.00am that morning, so I got Aidan up around 8.00am, and we left around 9.00am. Unfortunately, the weather had taken a definite turn for the worse after the nice weather we had had for the last couple of days – it was grey, misty and much colder than it had been. I was grateful that we had been up to the top of the Empire state and Rockefeller centre yesterday, as you couldn’t even see the tops of the buildings today, so we would have been able to see very little if we had gone up today. We were going to find somewhere to have breakfast this morning, but in the end we couldn’t decide where to eat, so we decided to just get the subway down to Battery Park instead. The closest station to Battery Park appeared to be South Ferry, which is on the 1 line, the station on 50th street, just a couple of blocks from our hotel was on the that line, so we made our way there. There are 2 entrances to this station, one you have to use if you’re going uptown, and one which is on the other side of the street if you’re going downtown, which was the one we had to use. The metro cards worked without any problem, and a train arrived within a couple of minutes. From watching TV and films, I expected the trains to be covered in graffiti, but there was absolutely none of that, and they were in fact just as good, if not better than the London underground. When we first got on, the train was reasonably full but after a few stations, it emptied out, and by the time we got to South Ferry it was pretty much empty. 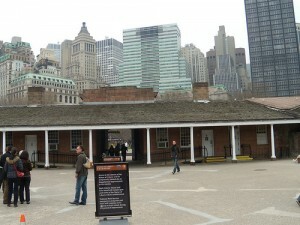 When we came out of the station, we were right in front of the Staten Island ferry terminal, and Battery Park was only a couple of minutes’ walk away. There are nice views of Liberty Island from the waterfront at Battery Park, but as I mentioned, the weather wasn’t the best, so the view was a bit hazy today. We had a look round castle Clinton, which was a fort built in 1812 to keep the British out. 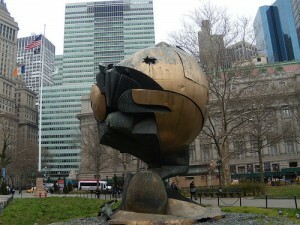 There is also a sculpture by in the park, which was originally in the plaza of the World Trade Center and was damaged on 9/11 and was moved to the park in 2002. There is also an eternal flame that burns there in memory of all the people who were killed. When we first got to the ferry terminal, I saw a huge long line waiting for the ferry, and thought that it would take forever to get to the islands, but there was also a much smaller queue next to that one, which turns out was for people who had booked tickets for a certain time. We looked around until 10.55 then joined the reserve ticket queue, again we had to go through a security check and then onto the ferry, our ticket time was 11.00am, and the ferry finally left the dock around 11.30. They did announce that the standby line to get into the security check was an hour – so if you’re planning on visiting, I would definitely suggest booking a reserve ticket for a certain time (the earlier the better) online before you visit. I was up at 6.00am the following morning thanks to the time difference and travelling. I dragged Aidan out of bed around 8.00am, as I wanted to get to the Empire State Building as soon as possible, as I’d read it can get busy later in the day. We were out of the hotel and walking towards the Empire State Building by 8.20am. One thing that I liked about the New York streets is that once you’ve got your head around the street and avenue numbering system, it’s very easy to find your way around. 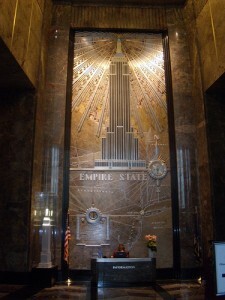 We arrived at the Empire State Building around 8.40am, and went straight in. We found that most attractions in New York had security checkpoints, and this was no different, so we went through the x-ray machine and metal detector and there was no wait at all for the lifts, so we were straight up to the 86th floor and out onto the viewing deck. Before we went up to the viewing deck, there was an interesting exhibition of the history of the building, which we spent a good few minutes looking at. Luckily, today was another fine day with clear blue skies, so we had a great view of everything for miles around. When we first got up there and wanted to take photos, we were a bit worried about holding our cameras through the fencing in case we dropped them but we soon got over that and were snapping away. It was really amazing the view from up there, you could see the whole of Manhattan, looking south right down to the Financial district and the Statue of Liberty, and looking north, right up Harlem in the north. We spent a good 1 ½ hours up there, just taking in the view and taking lots and lots of pictures, it helped that it was a nice day, with very little breeze, so it was very comfortable up there. I had bought a souvenir map which unfolded and showed a lot of the points of interest to the north / east / south /west, which came in useful. Anyhow, after these 1 ½ hours, we decided it was time to move on, so we made our way down, stopping at the gift shop to buy a couple of presents for the family at home.